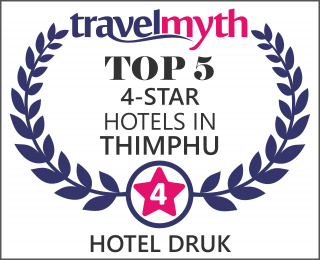 The Hotel Druk restaurant enjoys an unparalled brand equity and is revered for the fine dining experience it provides. The restaurant serves authentic Chinese, Indian, Thai , continental and Bhutanese cuisines. Our chef, Santanu Kundu, has a vast repertoire of delicacies and has recreated many classic Indian, oriental and continental dishes while developing new recipes based on fresh local ingredients. The challenge, according to our chef, is in creating the ‘harmony’ in each of the dishes on the menu. We are unwavering in our insistence on the highest quality ingredients and raw products. We are committed to using the freshest, most healthful, minimally processed meats and produce available. Virtually everything we offer is made from scratch and cooked to order. All our food is prepared in 100% pure, cholesterol free, zero trans-fat vegetable oil.